Posted in Baseball, Chicago Blackhawks, Gary Railcats, Northern League, Winnipeg Goldeyes. On a night where I was more concerned about seeing former Irish pit cher Tom Thornton and former major leaguer Felix Jose another player sprung up to steal the show. 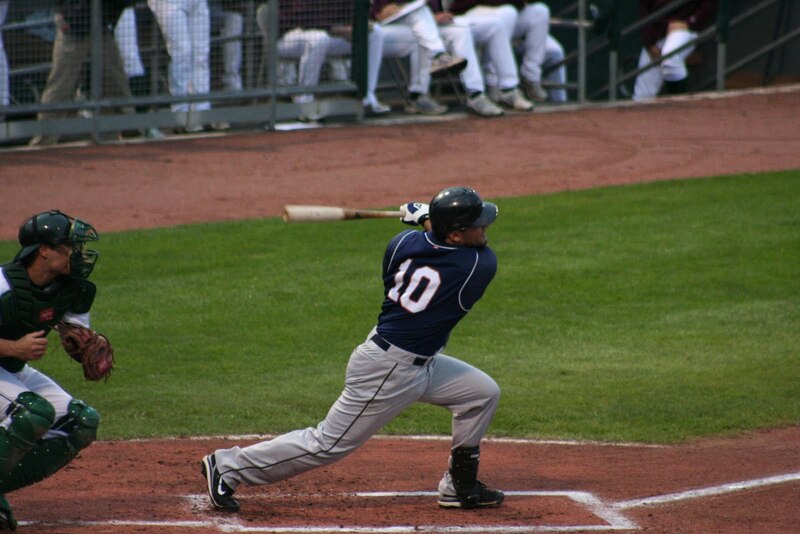 Former South Bend Silverhawk Richard Mercado got on base four out of five times last night, and really stole the show. I was focused on Jose in the on deck circle when I heard his name. It sounded familiar, and when I saw him I realized he was the former Hawk. Fitting that he would steal the show on the night the Hawks of the hockey world were featured. He is shown to the left rapping out his first inning RBI single. 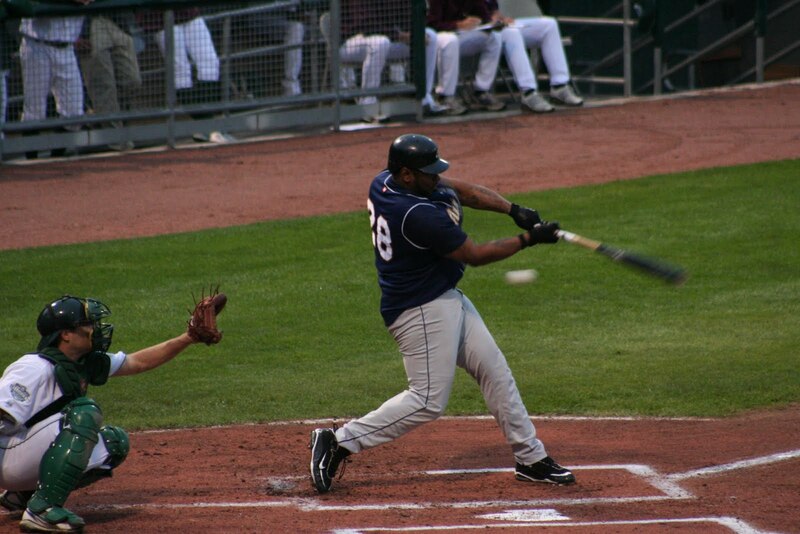 He has a nice swing, and was a pleasure to watch again. One player that I had never seen play before was Felix Jose. Felix played eleven years in the big leagues for the Athletics, Cardinals, Yank ees, Royals, and the Diamondbacks. He also spent some time playing in South Korea. This man has had a good run. Why would he be riding buses in the Northern League playing for the Schaumburg Flyers? At tender age of 44 no less? Your answer is as good as mine. He was batting fifth, but swung the bat like a ninth place hitter. Let me take that back. He made contact like a ninth place hitter. He swung hard, but was off much of the time. He went 0-5 on the night. His first two at bats were not only strikeouts, but strikeouts that made him look very bad. He did reach on an error in the fifth inning. The picture to the right shows him striking out in the first. He just seemed a little slow on the fastball. Who am I to judge. I am 12 years his junior, and I couldn’t catch up to the high heat. The Railcats lost the game 5-2, and much of the blame for that loss falls squarely on the sh oulders of Tom Thornton. 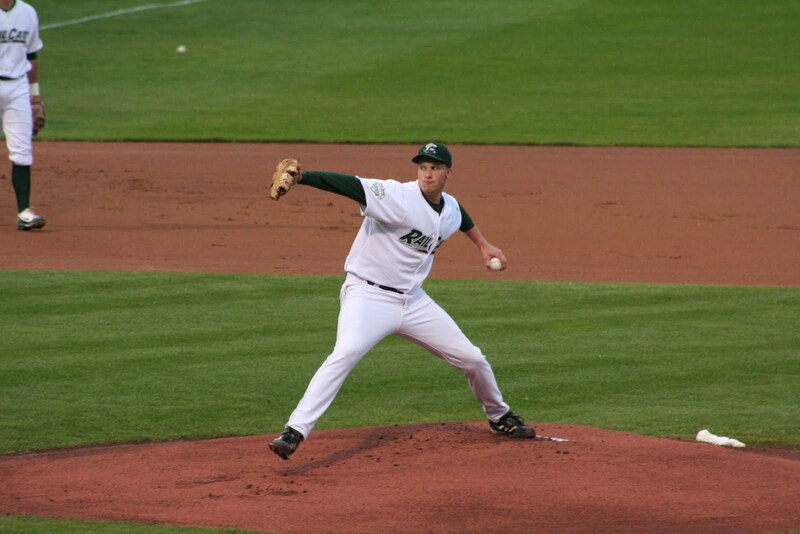 Tom was the ace of the 2006 Notre Dame pitching staff that featured Jeff Samardzija and Jeff Manship. It was looking into where he ended up that started the minor league update feature on this blog. I was excited when I saw that he would be starting for the Railcats. He got off to a slow start by giving up three runs in the first two innings. It could have been much worse. He gave up seven hits in the first three innings. He seemed to settle down though pitching a good fourth inning, and pitching out of a jam in the fifth. He gave up two more runs in the sixth, and the former Irish star was pulled from the game with two outs in the seventh. It was still nice to see him pitch, and I hope that he works out whatever he is going through right now. He had the stuff to make some hitters look silly, and then he would just leave a pitch over the plate to the next hitter. He will get to pitch in the Northern League Playoffs this year though thanks to the turnaround the team made since the beginning of the season. Posted in Chicago Blackhawks, Gary Railcats, Minor League Baseball, Northern League, Notre Dame Baseball, Schaumburg Flyers, South Bend Silverhawks. Tonight as promised I was at the Gary Railcats game. Going to the game it was a downpour, and standing in line to get in the rain never let up. As they opened the gates though the skies cleared. They even got the game in. I will tal k about the game more tomorrow. 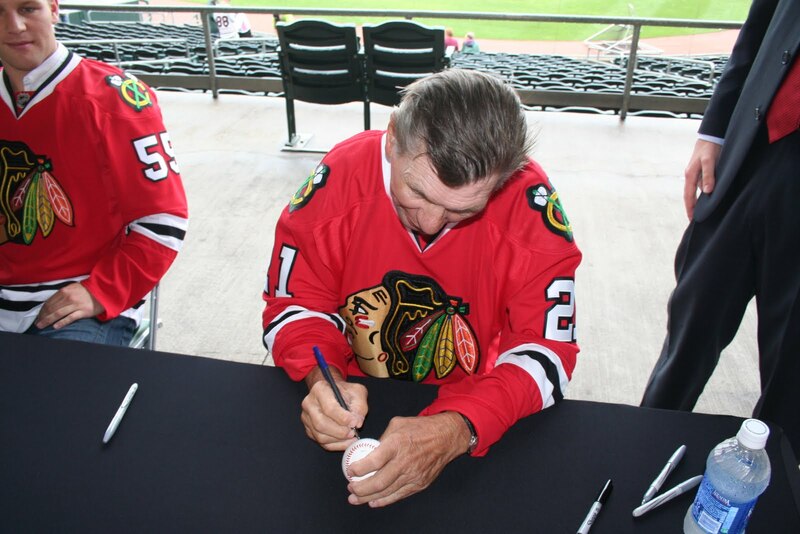 What is important is that I was able to meet Blackhawks legend Stan Mikita. 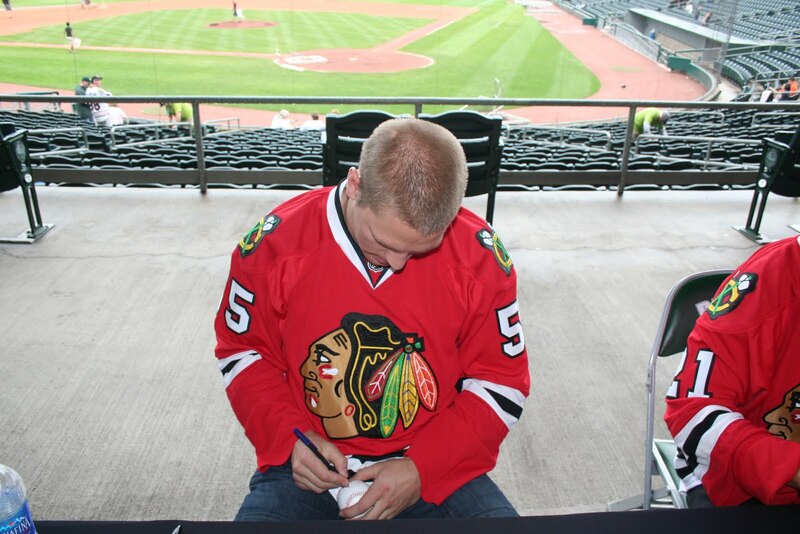 He was at the game with Ben Eager who is one of the current enforcers on the Hawks. Both players were very gracious, and Ben even helped me out when I came back to get a picture with the two of them. Stan was very busy as you can see trying to keep up with the flood of people who wanted his autograph. I even saw a few people skip Ben altogether. I may have thrown a curveball into the mix. Everyone I saw in line had a puck, a sweater, or something else hockey related for the players to sign. I don’t collect any of those things. I collect baseballs. So I had both of these players sign a baseball for me. Stan looked as if he has done this before. He gave me a great ball for my collect ion. He is shown signing the ball in the upper left. Ben on the other hand looked at me funny when I handed him the ball. When an enforcer from the NHL looks at you funny you start looking for the exits. He signed the ball though, and it looks great as well. Ben is shown signing to the right. Both men did much better than many baseball players I have had sign. I went back to my seat after getting the autographs and realized that I should have a picture taken with the two athletes. I grabbed my things and went back only to be thwarted by the Blackhawks security man. 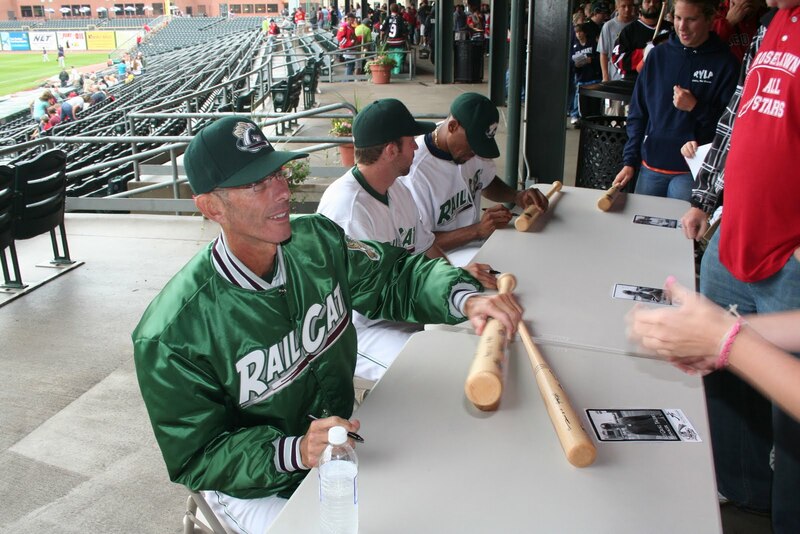 A very nice woman who is a Railcats photographer took my camera for me so that I could get a guerilla shot in. Ben was even gracious enough to look up for the shot. That is the picture at the top of the post. The security man was not happy with me, but I got my picture. This was a great night with the Hawks that really makes me want to go back to the stadium and see a Hawks game. With any luck tomorrow I may be able to add a Bo Jackson autograph to my collection. That would be great. Once I got through the line to g et the two Hawks players I jumped in a very short line to get a few Railcat autographs. Manager Greg Tagert, outfielder Steve Haake, and Vlad’s cousin Christian Guerrero were all signing. I got them all to sign a ball, the promotional pictures handed out along with the Hoosier bat that was given away. The two players seemed as if they really did not want to be there. Greg on the other hand was very nice. He is shown to the left handing a signed bat back to a fan. I imagine that it gets old signing your name over and over again. I on the other hand collect baseballs with names on them so I am glad that they do it. Posted in Chicago Blackhawks, Gary Railcats, Minor League Baseball, Northern League, Schaumburg Flyers. Tonight I am headed to the U.S. Steel Yard to see the Railcats play the Schaumburg Flyers. This would normally be a trip that I wo uld dread since it looks as though it is going to rain. A couple of things make this a cool trip. One is that Felix Jose is a member of the Flyers. He was considered a very good prospect for a while. All kidding aside though two members of the Chicago Blackhawks will be on hand. 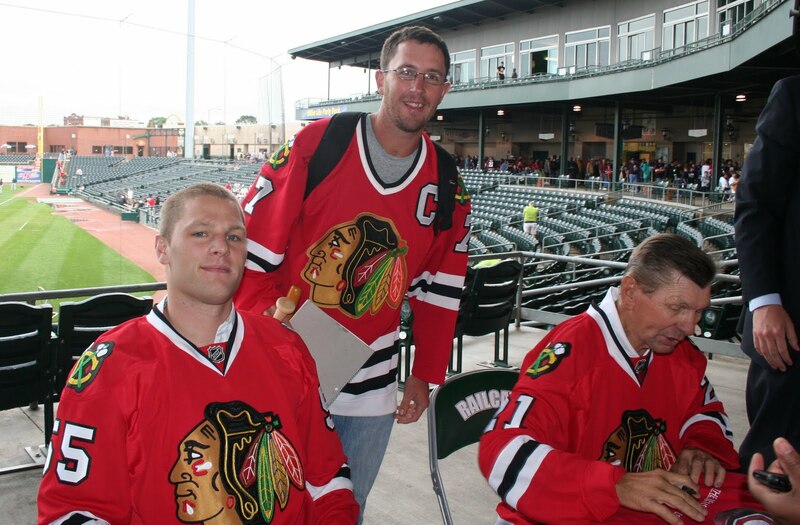 One of them is Ben Eager, and the other one is none other than Stan Mikita. They will be signing autographs on the concourse during the game. 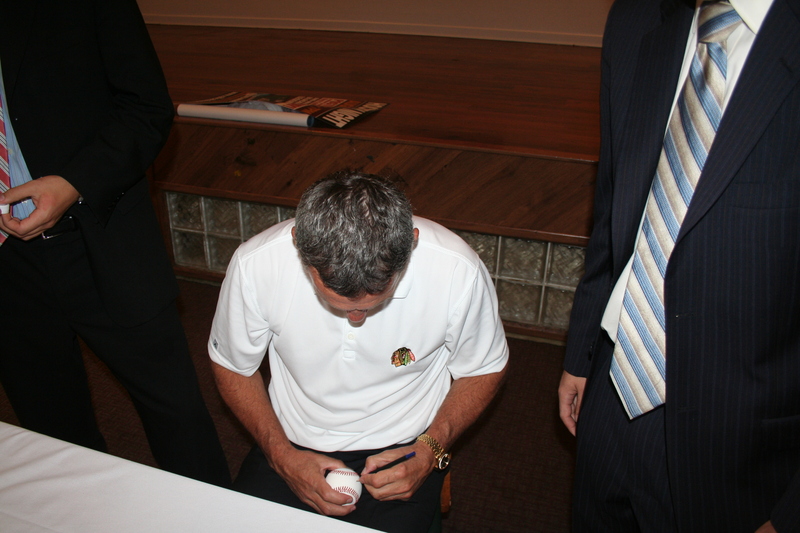 Stan is one of the beloved Blackhawk players, and it will be an honor to meet him. The Railcats are also giving away 1,500 black Hoosier bats with both the Railcats and the Blackhawks logos on them. Well I had better go wait in line. I want one of these bats! It seems as though the NHL would like to see hockey at Wrigley Field next winter. 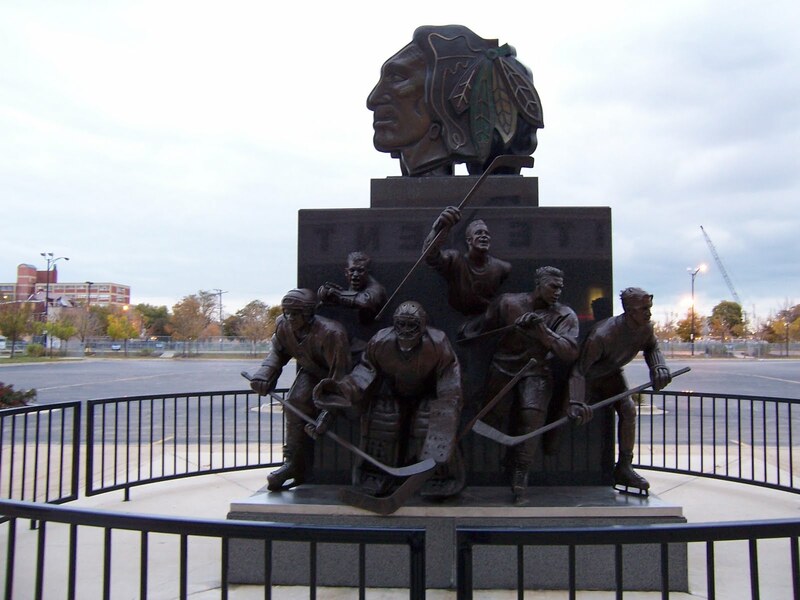 The game may be announced soon, and from what I have heard it will be the Blackhawks and the Red Wings in the second outdoor game ever. I for one would love to see this happen. I am a hockey fan that has stayed away from the ice for a while. This might be the perfect way for me to get back into the swing of things. It could also be another chance for me to see Chris Chelios on the ice again. I found the picture above over at Deadspin.com, and thought that it was appropriate for the post. I think that the Cub faithful would not even notice the difference if a hockey game was going on. They are just there for the party. If this does happen you will see a report from me after the game. There is no way that I a going to miss this. Posted in Chicago Blackhawks, Cubs, National Hockey League.